This stately courthouse with its massive Neoclassical Revival portico dominates a tree-barren lawn in Allendale. The courthouse has stood at this site, occupying an entire city block, since it was constructed in 1922. 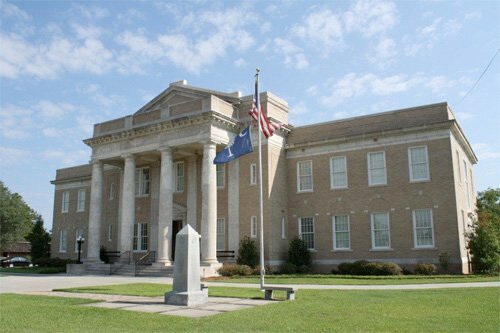 Of note, the building is Allendale County’s first and only courthouse – a rarity in South Carolina where county courthouses have often been demolished, destroyed, or simply relocated, some as many as four and five times. One reason for this constancy is that Allendale was the last county to be formed in our state, having emerged from Barnwell and Hampton counties in 1919. Allendale itself predates the county by nearly 80 years, having been founded in 1840 and incorporated in 1873. Both Allendale and Allendale County are named for Allendale’s first postmaster, Paul H. Allen. 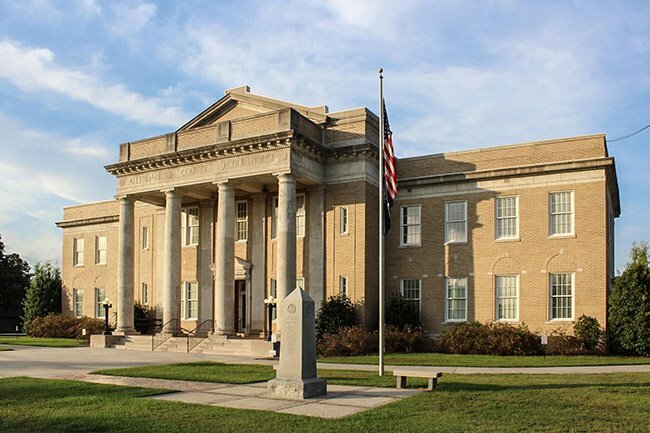 The Allendale County Courthouse was designed in 1921 by the prominent architectural firm G. Lloyd Preacher and Company, which had offices in Augusta and Atlanta. Construction was completed by A.J. Krebs and Company of Atlanta. To the rear of the historic structure, a two-story addition was added in 2004 to include various spaces for office use, a vault for the storage of county records, jury rooms, an expanded courtroom lobby, rooms for jurors and a courtroom that was modeled after the original but increased in size. Despite its relatively young age, the courthouse has not escaped hardship. On the morning of May 18, 1998, a devastating arson fire destroyed most of the second level’s interior. The lower level and the rest of the upper level had extensive smoke and water damage that proved beyond repair. The building was left exposed to the elements and interior spaces continued to decay. The exterior remained intact and allowed for reconstruction with stabilization of the load-bearing exterior walls. Inside, a massive restoration effort followed the original 1921 drawings and was executed by Watson Tate Savory Architects, Inc. of Columbia. The first floor with its central, octagonal lobby, arched hallways, transomed entryways, and decorative balustrades along the staircase all look exactly as they did in the beginning. 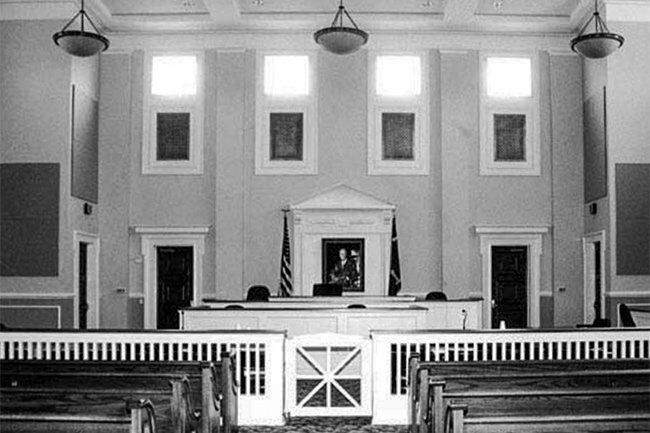 On the upper level, the old courtroom was divided into a county council chamber and offices with the new and much more spacious courtroom being in the modern addition to the rear. Allendale’s largely depressed economic situation made it unclear where funds would be found for this reconstruction. Ninety-nine percent of residents were in favor of rebuilding within the historic walls of the courthouse and agreed to pay a 1% sales tax increase to fund the building efforts. The efforts from Allendale’s citizens speak loudly of the area’s dedication to preservation. Flanking one side of the courthouse is a large flag pole and a granite obelisk monument dedicated to the citizens of Allendale County who fought in World Wars I and II, the Korean War, and the Vietnam War. The structure stands at the end of a long avenue with gardens situated in the median. The Allendale County Courthouse, constructed in 1921-1922, is significant as the county’s first and only courthouse. Allendale County, the last county established in South Carolina, emerged in 1919 from parts of Barnwell and Hampton counties, jurisdictions thought at the time to be too large to govern effectively. 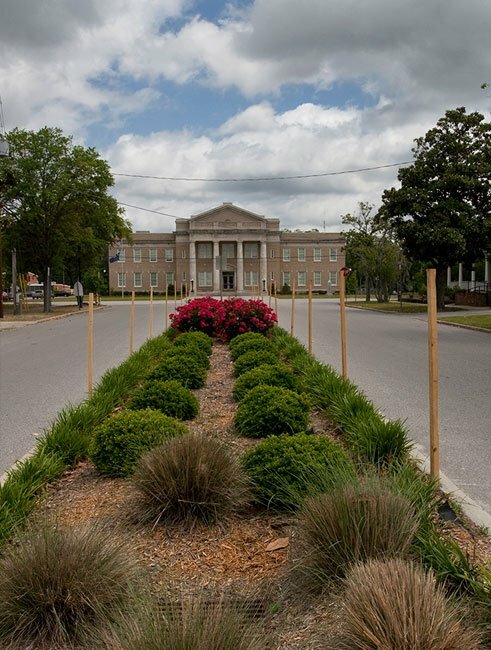 Plans for a courthouse actually began with the legislative act establishing Allendale County; therefore, this courthouse is not merely the only extant building in the county tied closely to the county’s founding but clearly the most significant public building in the county. It is also important as an example of the public design work in South Carolina of G. Lloyd Preacher, noted Augusta and Atlanta architect and native son of Allendale County. The A.J. Krebs and Company, general contractors of Atlanta, was engaged to carry out the building’s construction. The courthouse is a two-story yellow brick and limestone-accented building whose central block with pedestaled pediment is dominated by a monumental, unengaged, flat-roofed Neoclassical Revival portico. The portico features four massive limestone columns and responding pilasters of the Tuscan order, a classical entablature, and a brick and limestone parapet. Immediately to the rear [northeast] and connected to the historic courthouse by a narrow two-story hyphen is a large office and courtroom building that was completed and occupied in 2004. The new building’s construction was part of a larger project that included the overall reconstruction of the historic courthouse’s interior and rehabilitation of its exterior, following a devastating arson fire that destroyed much the building’s interior on the morning of May 18, 1998. The interior’s restoration, in plan and detail, is based upon the 1921 architectural drawings by G. Lloyd Preacher and Company. Listed in the National Register August 1, 2007.